Editor(s): Balega, Yu. Yu., Kudryavtsev, D. O., Romanyuk, I. I., Yakunin, I. A. In 2016 the leading center of Russian ground-based observational astronomy, the Special Astrophysical Observatory of the Russian Academy of Sciences, celebrated its 50th anniversary. As part of the anniversary celebration, the Observatory organized a conference to discuss a broad range of topics related to the astrophysics of stars and star systems, which brought together the leading experts from Russia, the Russian Commonwealth, and our foreign colleagues. The main idea of the meeting is reflected in its name: the life of a star from its birth (molecular cloud collapse) to death (supernova core collapse). The result of the conference is the present volume containing the latest achievements of the Russian astronomical community in stellar astrophysics, obtained both with domestic instruments and as part of international cooperation. 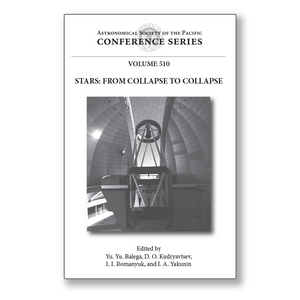 This volume presents recent results of the studies of star-forming regions and the interstellar medium, stellar atmospheres and magnetism, activity of stars, multiple stellar systems and exoplanets, and stars after the nuclear burning stage. Methods and instruments of present-day stellar astrophysics are also discussed.